Built 1883 and consecrated 1888, replacing an older church. The first church that was constructed at Jericho served the needs of the pioneers for approximately 50 years. At the end of that time it was decided that a new structure, built on a more comprehensive and elaborate scale, was desirable. The people of the district got together, and lt was agreed that all should co-operate In order that the old structure, which was beginning to show signs of dilapidation, might be replaced with a church of improved standard. The necessary funds were raised by means bf hard work, and the impressive edifice which stands overlooking the township of Jericho to-day was constructed. 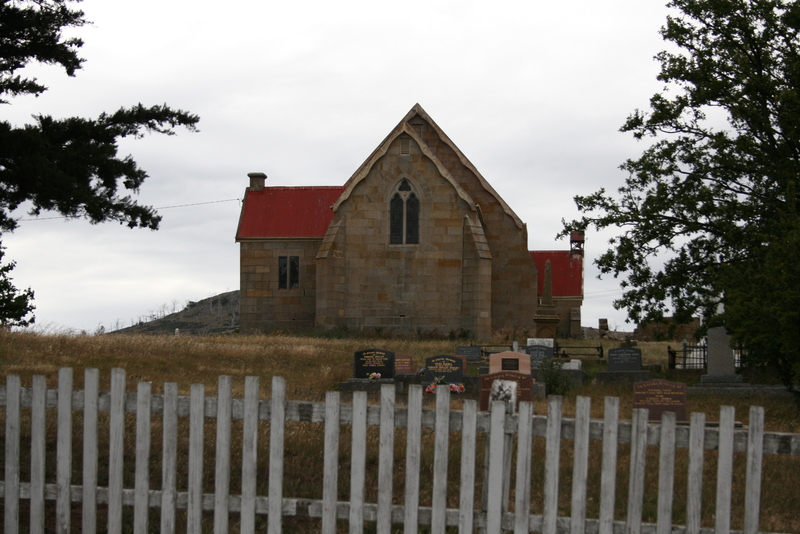 The contract was carried out by the late Mr. Walter Fish, of Oatlands, and the dedication ceremony took place 45 years ago, being performed by Bishop Sanford, who controlled the affairs, of the Church of England in Tasmania at the time. Built on the site of the current church. It was consecrated in 1838 during a visit by the visit but was presumably in use prior to this. At least two marriages took places there in 1883 (Samuel Horton & Elizabeth Hudson in April, and Rev. John Norman & Eliza Pike in May). The building was taken down 1882 to enable the construction of the new St James. (1) That it is expedient to erect a place of worship in the most populous part of the district. (2) That a-subscription forthwith be entered into for the purpose. (3) That application be made to His Excellency the Lieutenant Governor (who was then Colonel Arthur), soliciting the assistance of the Government in support of the undertaking. It was resolved that Mr. P. Harrisson be appointed-treasurer, and Mr. J. M. Hudspeth secretary, and that Messrs. E. Bryant, W. Pike, C. M. Cogle, James Weeding, P. Harrisson, and J. M. Hudspeth form a committee for the purpose of carrying the design into effect, and that any three of them would form a quorum. It was resolved that the thanks of. the meeting be given to Rev. Mr. Bedford for the, attention given by him to the action, and for his handsome conduct in the chair. It was suggested by Mr. Bedford that the site of the proposed chapel be on the hill on the rising ground between Mr. Harrisson’s house and Fourteen Tree Hill, being considered by him the spot most eligible to the population generally.